Sanand: Taking a swipe at Gujarat Chief Minister Vijay Rupani for reportedly not accepting a giant flag made by Dalits citing lack of space, Congress vice president Rahul Gandhi on Friday said he would have accepted even a 50,000 km-long national flag even if he had little space to keep it. 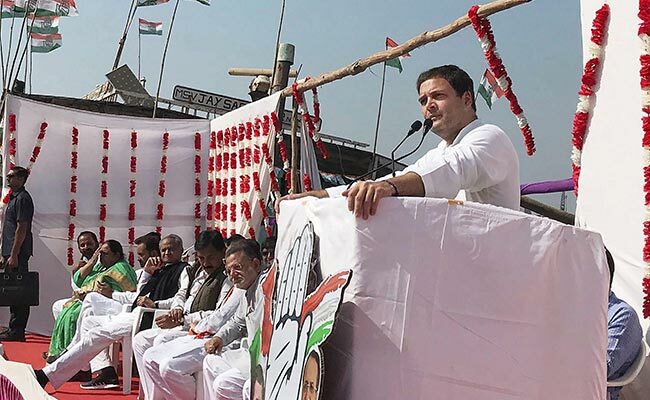 Rahul Gandhi said Prime Minister Narendra Modi and Mr Rupani have space in their hearts only for a few industrialists, but not Dalits, farmers and poor people. Mr Gandhi was addressing a gathering at the Dalit Shakti Kendra (DSK), a vocational training institute near Sanand in Ahmedabad, where he accepted a 125 x 83.3 feet national flag weighing 240 kg. The flag was earlier meant to be presented to Mr Rupani. In August, the DSK had even carried the flag to Gandhinagar. However, officials at the collectorate had allegedly refused to accept it citing lack of space. "This flag is not yours alone, but belongs to the entire country. He (Mr Rupani) said he has no place to keep the flag. Even if you gave me a 15-km or 50,000 km-long flag, and even if I had one inch space to keep it, I would have taken it," Mr Gandhi said. "Like you, I have a huge space in my heart for this flag. It is the mindset of the BJP chief ministers or the prime minister that they have no space for this flag or your hard work. But they have the entire Gujarat for 5-10 industrialists, who can get any amount of space they want in Gujarat or across India," said the Congress leader who has been on a Gujarat election campaign blitz in PM Modi's home state, which the BJP has ruled for 22 years. On the Vibrant Gujarat Global Investors' Summit organised by the state government, Rahul Gandhi said the state is vibrant only for "5-7 industrialists of Modiji" and not farmers, tribals or Dalits. The members of DSK said Dalits raised Rs 54,000 to make the flag, and they want the Congress leader to keep it at Indira Gandhi Memorial Museum in New Delhi.